Let’s Give You That Perfect Smile! Are you looking to give yourself a smile that you are proud of? Allow our team of professionals at The Smile Design Center of Dr. Myron Kellner to give your smile that perfect look. 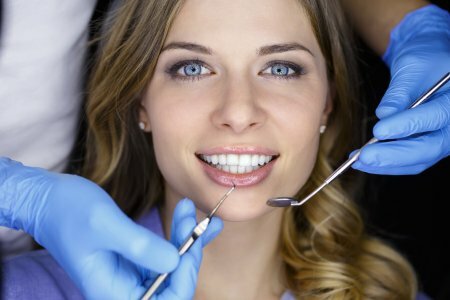 With a comprehensive set of cosmetic dental services, we are sure that we’ll have your ready in no time. Dental implants: Implants are used to replace teeth that have been damaged by trauma or tooth decay. Porcelain inlays and onlays: These “indirect fillings” are often made of porcelain and are placed over teeth that don’t have enough tooth structure left to accommodate a filling. Composite bonding: The dentist will remove the decayed tooth material and then bond a composite resin onto the decayed site, molding the material to create a natural look. Dental veneers: Placed on the front of damaged or crooked teeth, veneers are a fast, long-lasting solution to obtaining a perfect smile. Teeth whitening: Over time, teeth become discolored from the foods and liquids that we consume. Teeth whitening is a fast solution to restore the shine back to your smile. If you are ready to get that smile that you’ve always wanted, contact us at (410) 321-1100.